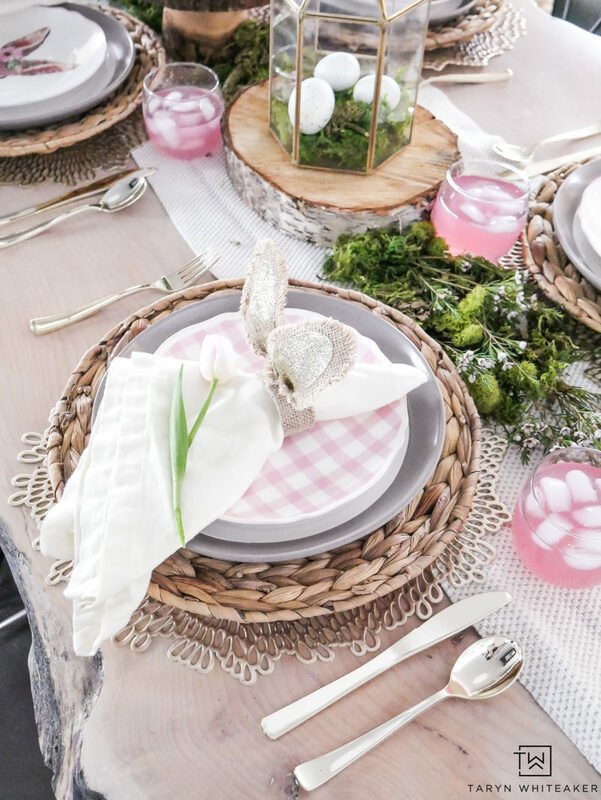 Styling tablescapes throughout the year has turned into one of my very favorite projects. 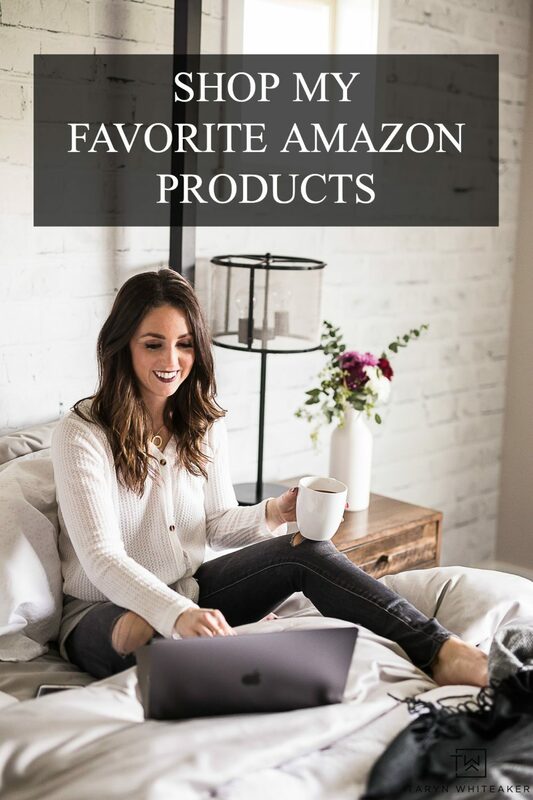 They are simple to put together, you can typically use what you have around the house, and they make your home feel SO welcoming. 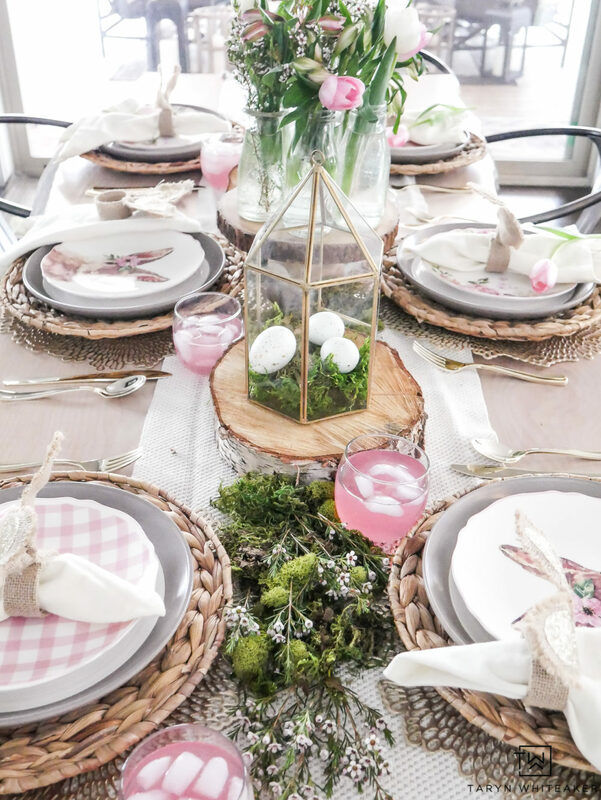 A few times a year I join Lory from Designthusiasm for a big Styled + Set Blog Hop where we all share our newest seasonal tablescape and it’s time for another one! 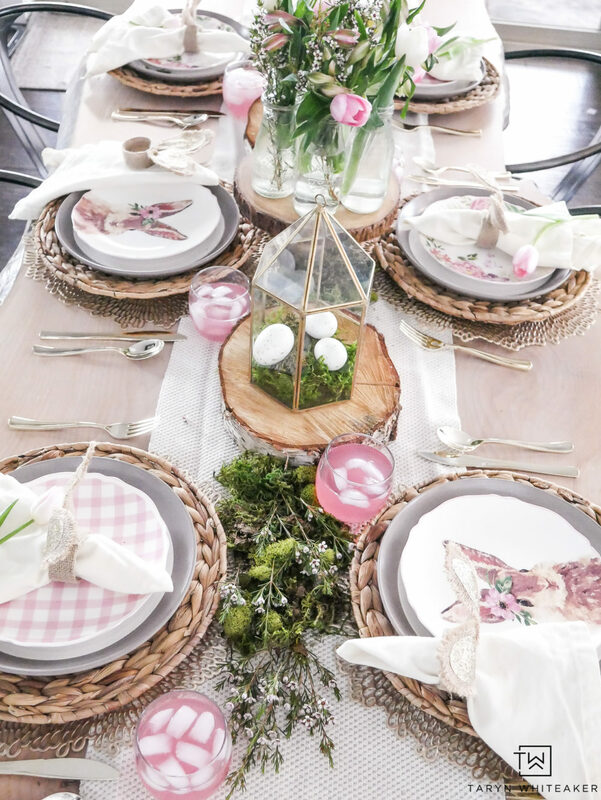 Keeping up with our Easter theme this week, I shared our DIY Hanging Flower Display earlier and now it’s time to show you the full Pink and Green Easter Table! I hope you enjoyed Maison de Pax’s beautiful table. 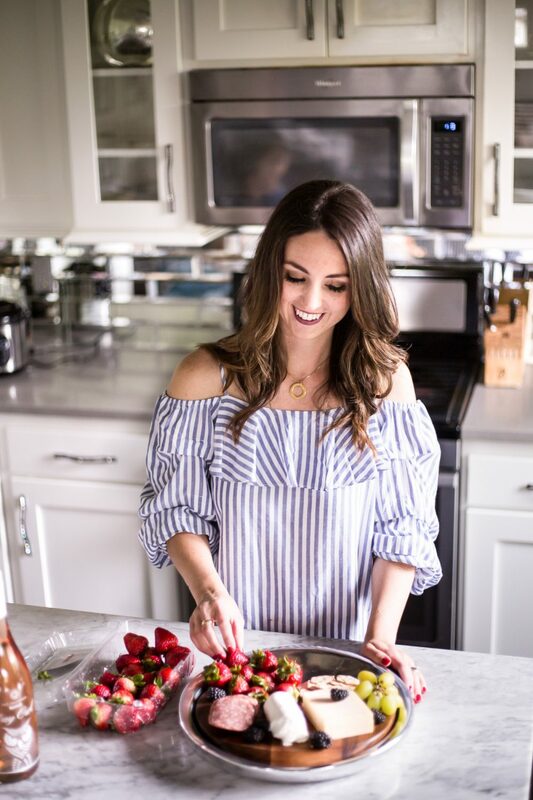 Rachel always does an incredible putting together gorgeous displays that look so effortless. She has a true talent! Michaels has these plates right now, they have tons of different patterns and colors. We picked all the pink patterns of course but they have more! They are $9.99 each but we bought them on a 50% off day, such a great deal! And those napkin rings, so so cute, right? 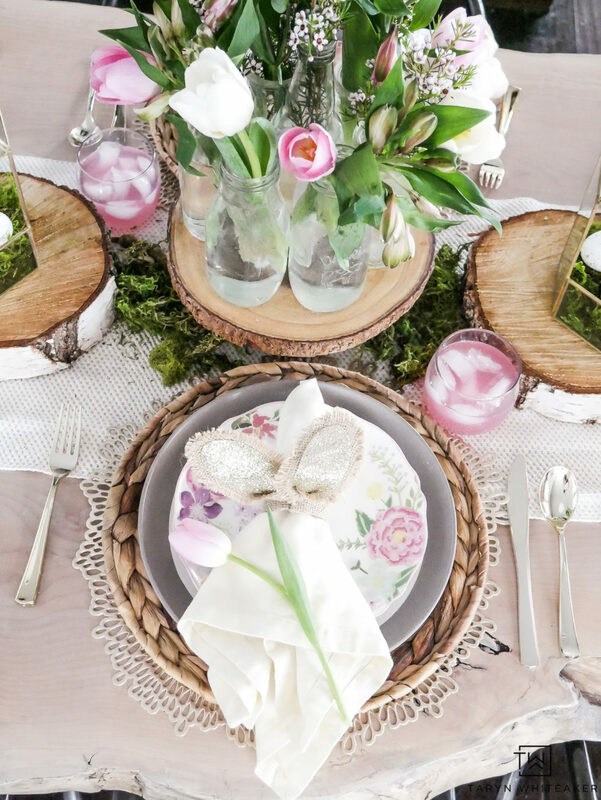 I added a little ‘enchanting’ feel to the table with moss and wood rounds with garden flowers. I picked up these milk glasses at the dollar store a few years ago and they have come in handy on so many occasions. 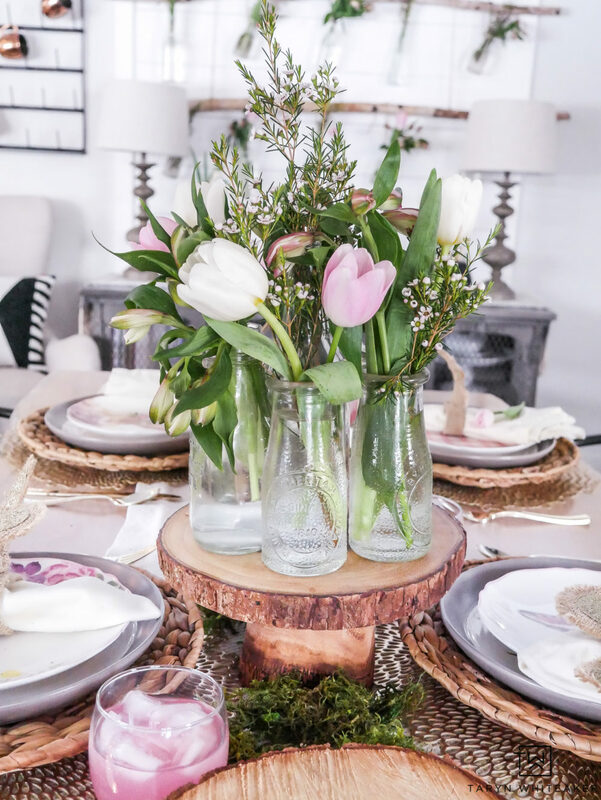 From cute drink glasses at parties to vases and candle holders, I’ve used them for SO much! I love the little terrarium trend that’s been around for awhile now! I found these cute gold lantern style terrariums at Michaels and then added moss and gold and white speckled eggs! They took minutes to put together and are a cute addition to the table. They add heigh and a little holiday flare. Let’s talk about layering for a second. 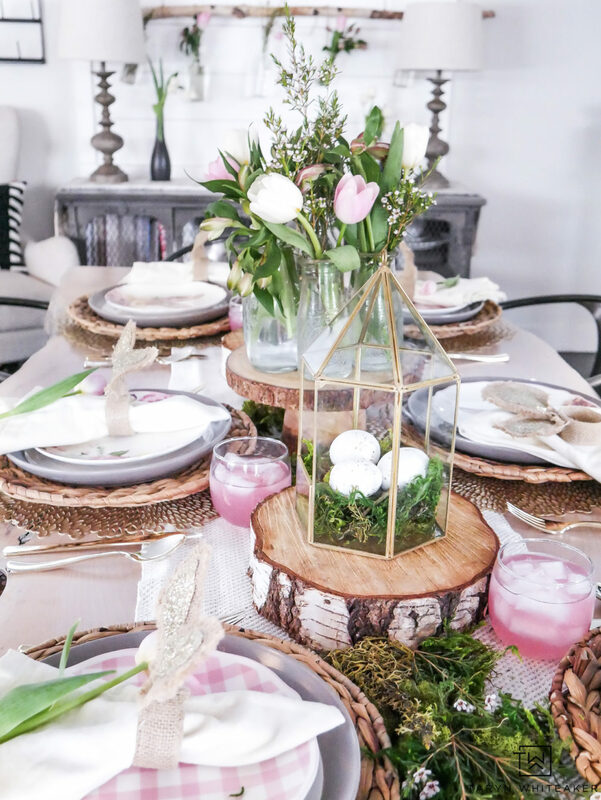 A few years ago I was looking back at some of my older table styling posts and 1) they needed a lot of work, they aren’t a speciality of mine and 2) I knew I needed to add more layers! I love layering in all my designs, combining tons of different textures brings so much depth to a design and keeps your eye moving. And my tables have been lacking a lot of it. With the live edge table it’s hard to add a tablecloth because of the uneven sides, so I have to add my layers elsewhere. On this table I added a placement, charger and layers of dishes. I think the extra gold leave placemat adds just a little more and I think I could even bump it up a bit! This spring I transformed our shiplap display into a DIY Hanging Flower Display! 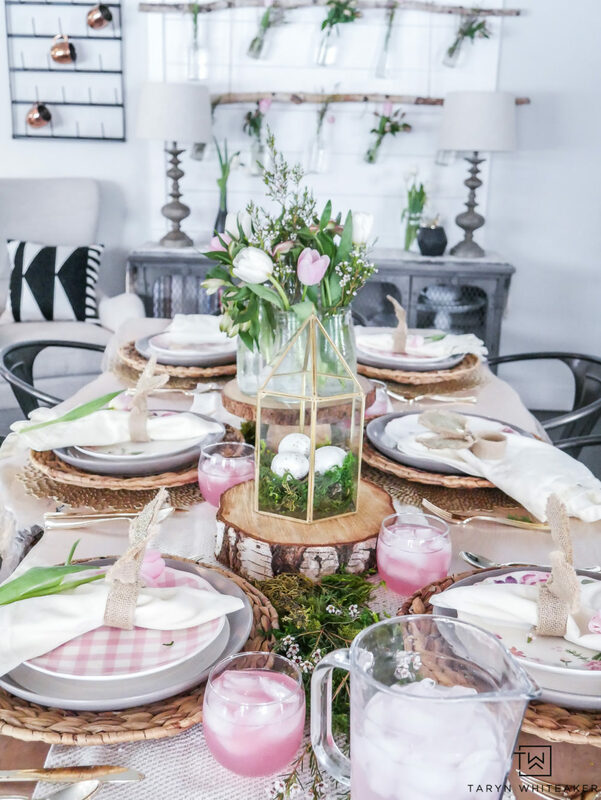 Click the link to view the whole look and all the branches. 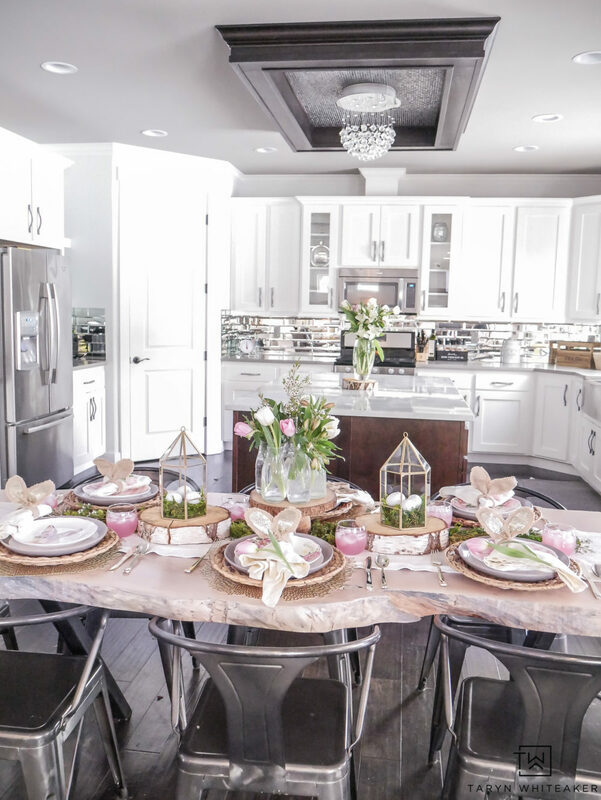 It makes for a great backdrop for parties! 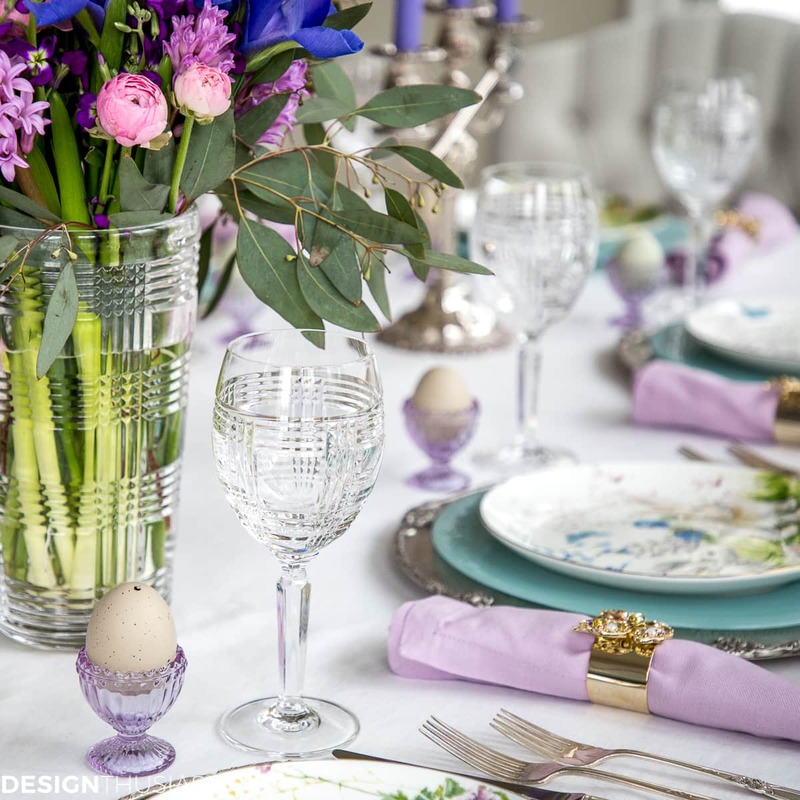 Now please hop on over to Stone Gable, her tables are always so elegant and inviting! Those bunny touches are just perfect! Hi Taryn! Your table is stunning! 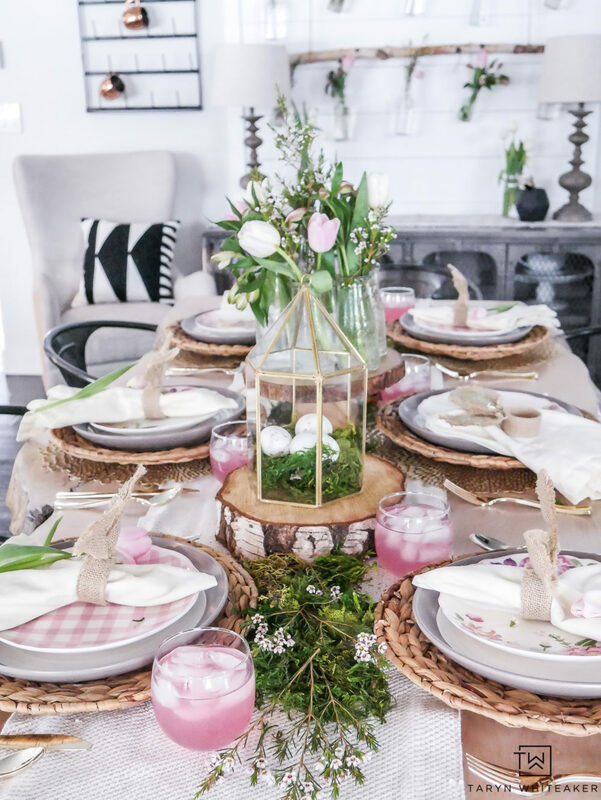 What a unique table top…and all the details are so inviting! 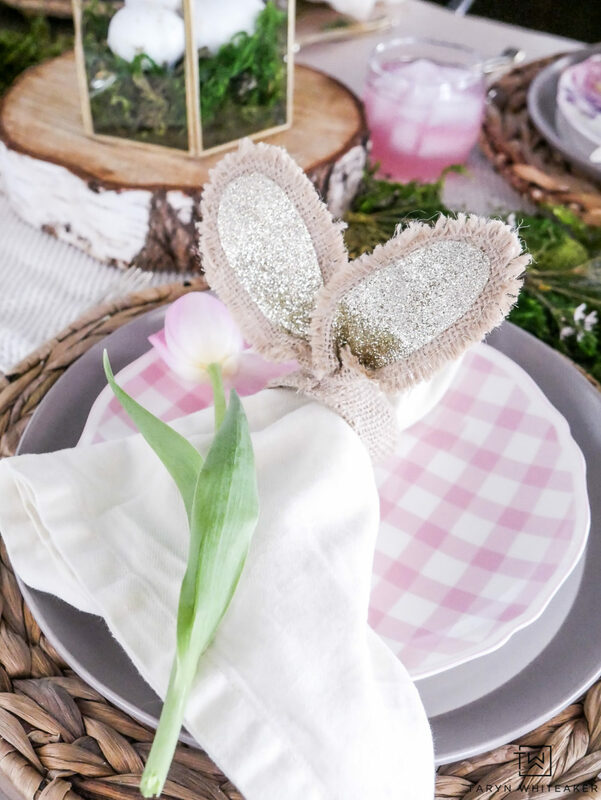 So SPRINGY – love the bunny touches! Love your table! so many cute details!! How fun that this is something that you can enjoy doing with your daughter. I am sure she will appreciate a well set table when she gets older. 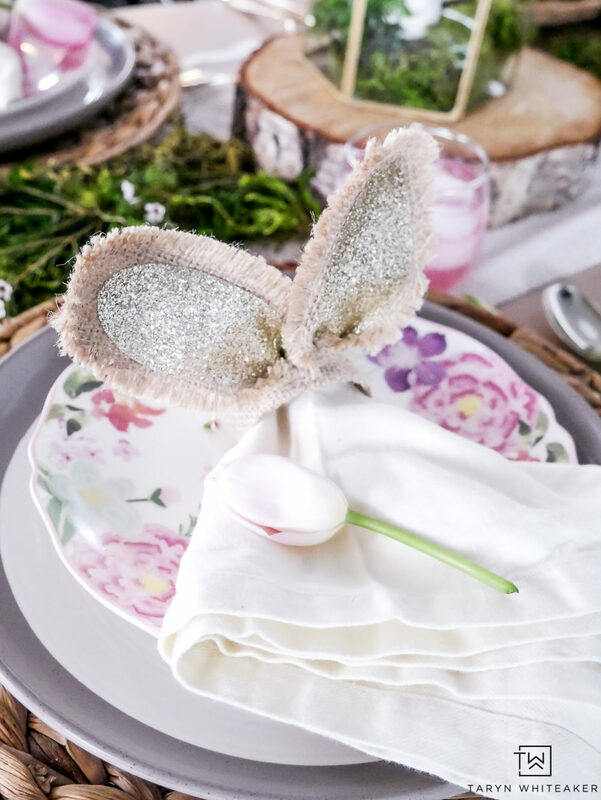 I have those same bunny plates -so it is fun to see what you did with them. Taryn, this one really speaks my language because I’m a huge pink and green fan!! How positively lovely it is! Oh my gosh, Taryn!!! This is so pretty!! I love all your details with the wood slices and moss and bunnies. Love it all! Thank you so so much Jamie!!! Your table alone is gorgeous! You and your daughter have great taste and I love all the pink. 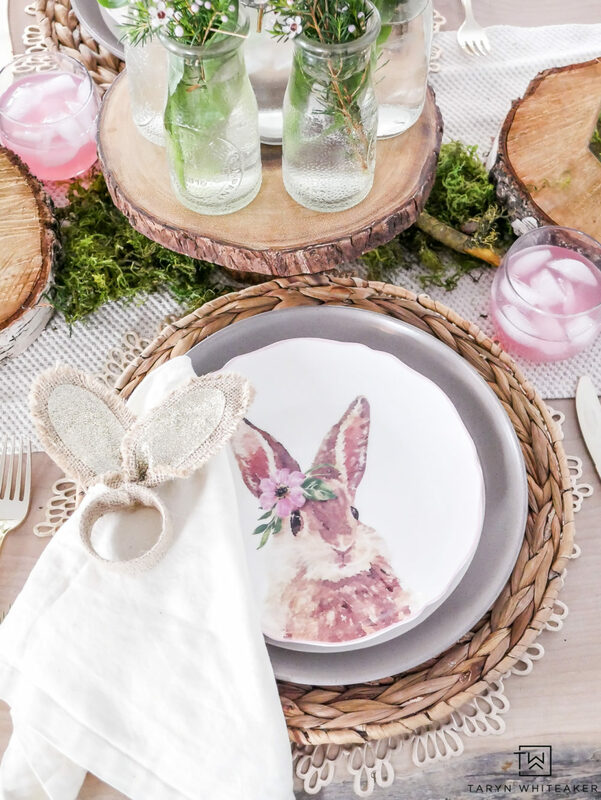 The bunny plates are adorable and I’m so sorry I didn’t pick them up when I was at Michaels last week.